We are all very excited here at the studio to kick off our 8×10 mini print series with Houston, TX illustrator and surface designer Sarah Welch. 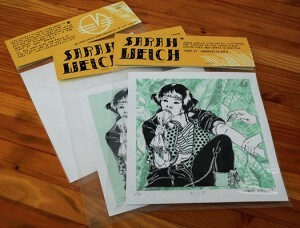 Sarah’s print was produced in two silkscreeened limited editions, both come packaged in a retail style poly bag with header card. The ‘Light Mint’ edition is a 2-color silkscreen sized at 8×8″ and signed and numbered out of 40. The ‘Jungle’ edition is a 4-color silkscreen sized at 8×8.5″ and signed and numbered out of 50.